Increasingly, enterprises are opening their data and applications to partners, developers, mobile apps and cloud services. APIs provide a standardized way to open up information assets across the web, mobile devices, serviceoriented architecture (SOA) and the cloud. However, to make API information sharing safe, reliable and cost-effective, enterprises must deal with critical security, performance management and data adaptation challenges. CA API Management combines advanced functionality for back-end integration, mobile optimization, cloud orchestration and developer management. 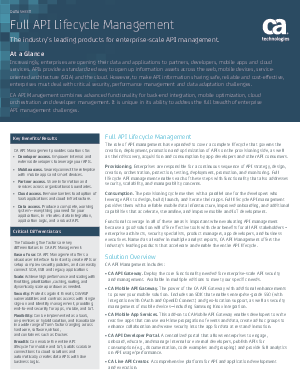 It is unique in its ability to address the full breadth of enterprise API management challenges.